The PMA-350H incorporates Roemtech's Auto HummBuster technology (patent pending) on all three inputs. This allows any installer or end user to simply push a button to "switch off" annoying hums or buzzes without affecting audio quality. The process can be initiated simply by pressing the button on the front panel or optional wall plate and will effectively filter out hums and ground-loop issues within seconds. Noise issues don't have a chance. The new auto PA override utilizes Roemtech's proprietary self-adjusting circuitry so that you can connect PA systems that range anywhere from 25V to 100V without having to make any adjustments. 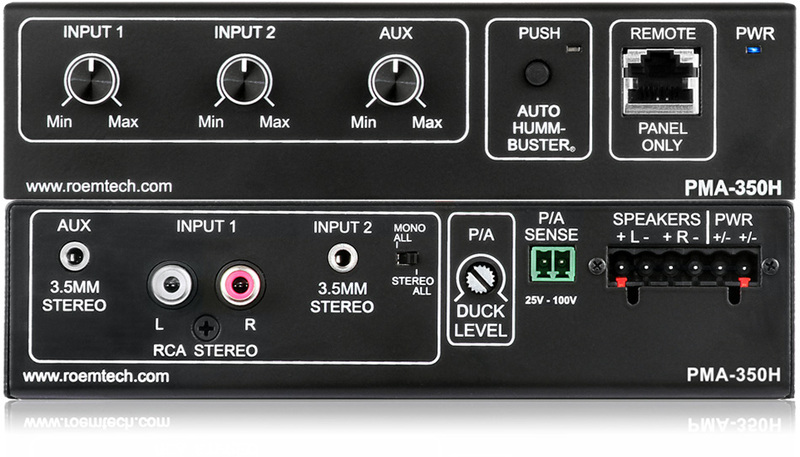 A simple two conductor jumper is all you need to wire the PMA-350H into the PA system. When a signal is detected, the amplifier automatically goes into a mute condition until the signal is gone. Two seconds later, the amplifier comes back on. The PMA-350H has a very effective power reduction mode. When the amplifier has not been used for 20 minutes, it will go into a "sleep" condition that reduces the power consumption to less that 0.9 watts of power. This results in big power savings over the life of the equipment.